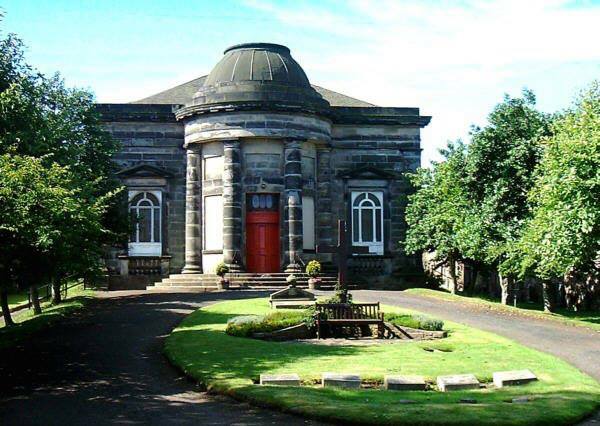 St Mark’s Church, with its surrounding graveyard, is a landmark structure on Portobello High Street. The graveyard contains some architecturally significant monuments. Many of these monuments are attractive designs in a mix of Gothic and Classical styles. The church is recessed well behind the established building line. It is set within a tree lined burial ground, enclosed by a boundary wall (please see here for news of our project to restore the wall). The resulting combination of a church placed in line with a gateway and with the churchyard in a formal arrangement is unusual in Scotland and unique in Edinburgh. The Vestry was granted the right to open a burial ground in 1828 after a long period of litigation instigated by the owner of a neighbouring villa. The burial ground was consecrated on 11th November 1828 and the first recorded interment, on 20th December 1828, was that of Miss Frances Nicholson aged 80, who had donated the first communion vessels to the church. The headstones provide a valuable insight into the social history of Portobello. In the 19th century, the church membership was drawn mainly from the upper reaches of Portobello society with a large proportion of retired naval and army officers and colonial civil servants. However, the early records of the burial ground show that a fair number of persons from the working classes were interred there. At that time there were three classes of interment, purchased graves, those leased for seven years, and paupers’ graves. The church made a point of insisting that its own mortcloths, batons and caps, bearers and ushers were used at any interment. Mortcloths cost up to one pound two shillings and sixpence (£1.12); grave dues two shillings and sixpence (12 p); turf five shillings (25p); batons and caps four shillings (20p). There are a high number of military graves, telling us about the history of Portobello with its strong military and colonial connections. This continued into the twentieth century and there is also a Commonwealth War Grave ( Flt Sergeant Hamish Ian Sandison) . Alongside these military graves, there are a number of headstones which tell of the loss of large families, in childbirth and infancy, and those who were unable to afford the burial costs. It is the only historic graveyard in Portobello still in use today. To read the early registers is to realise that behind each interment there is a bereavement that was just as real for those who lived and died more than 100 years ago as it would be for us today. Margaret Douglas, daughter of Lt. Colonel Douglas, died of “a decline” on 16th August 1834, her father “died of old age and grief” on the 21st. Rice Forsyth, proprietor of the popular line of stage coaches to Edinburgh, and all his family. The Forsyth family memorial is on the wall at the south west corner of the graveyard. The family also owned what became the Royal Hotel at the top of Bath Street. This was the terminus for the Forsyth coaches. Samuel Johnston, aged 28, died from the effects of injuries received on the Leith and Dalkeith Railway, 1845. Clementina Wemyss, aged 27, who was the “relict [widow] of the late Hon. Sir James Dewar, Chief Justice of Bombay”. Her memorial, on which her date of death is 21 January 1834, is on the west wall of the graveyard. John Henderson, of Glasgow, workman in search of employment, died of consumption in 1837, interred by the Glassmakers Guild. Charles Nealson, described as a Post Boy to his uncle, Postmaster Edinburgh, drowned by the sea on the night of February 12th, returning from Prestonpans. the three children of “Captain and Mrs. Wright, at present in India, from Mrs. Pine’s lodgings.” All three aged between 4 and 12 years died within 2 years of one another. 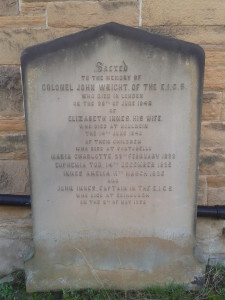 There is a large memorial, in excellent condition, on the back wall of the church to Colonel (as he became) John Wright of the East India Company who died in 1842; his wife, Elizabeth Innes, died 1840 and their three children who died between 1833 and 1836. When the chancel was added to the church at the end of the nineteenth century, a section of the graveyard was covered by the new building. The church’s burial records are kept in the City of Edinburgh Archives, other than the current Book of Burials. A lair plan is kept in the church with as much information as we have discovered on it. Please contact us if you would like to consult it. 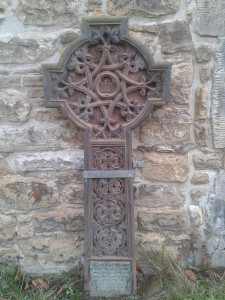 The boundary wall of the graveyard is in serious need of repair and the church is currently seeking funds to repair it. It is (like the church) Grade B listed, and the gravestones are memorials are placed directly onto the wall in many places. Surveys have been undertaken by the Scottish Lime Centre and by Addison Engineering Consultants and a design team (Simpson and Brown) were appointed in 2013. Currently estimates for the cost of the works and attendant interpretation and research is in the region of £120,000. To date, through the generosity of the Scottish Episcopal Church Dunderdale Fund and the Pilgrim’s Trust, and from church giving, the church has raised £57,000. It is hoped that we will be able to start on the emergency work, where the wall is in imminent danger of collapse in the Summer of 2014.